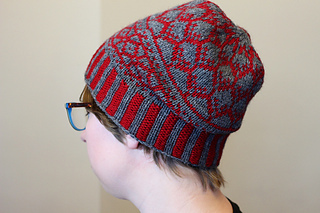 Knit from the bottom up in the round with deep corrugated ribbing for the hem, this hat has a simple eight stitch repeats to form the pattern. 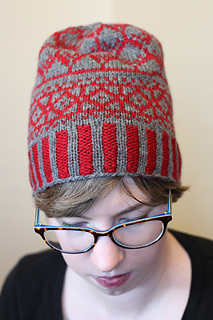 The pattern will work best in solid and semi-solid yarns with some contrast. 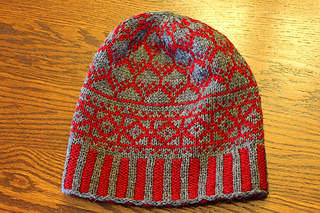 Medium (Large). Show in size Medium. Sample knit in Cascade 220 Sport by Cascade Yarns (100% wool; 164 yards/150 meters per 1.75 ounces/50 gram skein) 1 skein in color 9404 (MC) and 8400 (CC).